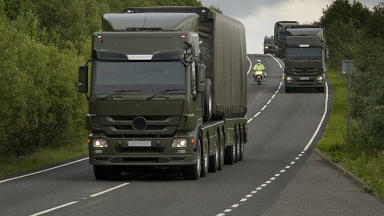 SNP's Douglas Chapman has called for local authorities to be notified of nuclear convoys in advance. SNP MP Douglas Chapman has urged the UK Government to give the Scottish Government advance notification when nuclear material is being transported on Scottish roads. The issue was raised in Parliament earlier this month, with Westminster confirming that local authorities are not given advance notice of movements that involve the transportation of Defence nuclear materials. Currently, police forces are notified of any nuclear convoy being routed through their area but have no obligation to make local authorities or the general public aware of any movement of nuclear material. Earlier this month, campaign group Nukewatch UK raised concerns about the transportation of nuclear weapons through the Midlothian area. The revelation that convoys had on occasion parked close to schools was received with public outcry in the local areas affected, prompting their local MP to take action. SNP MP Owen Thompson received cross-party support when he proposed that legislation should be introduced to ban the use of the nuclear convoys which travel between Berkshire, where the weapons are made and serviced, and Coulport in Argyll, where they are stored and loaded. Mr Thompson said: “These convoys are transporting the most dangerous and obscene cargo though Scotland’s towns and villages and it is vital that the UK government is transparent about the safety measures in place - as the consequences of any safety breach simply do not bear thinking about. “It was once spotted parked up at Glencorse Barracks while the driver took a break. So there were six nuclear warheads sitting beside Beeslack High School. “If passed, my bill will put a stop to these nuclear weapons convoys that drive past homes, shops and schools on their way to and from Coulport in Argyll and I am delighted to have received parliamentary support for this proposal." Douglas Chapman MP, who sits on the Defence Select Committee, believes current protocol for the transportation of nuclear materials is untenable, putting the Scottish communities at unnecessary risk. He said: "The transport of highly dangerous nuclear material along Scotland's roads, close to houses, shops and schools, is completely unacceptable and represents a huge risk to public safety. "The consequences of any accident are absolutely chilling but if the very worst were to happen then the Scottish Government, along with local authorities, would be expected to step in and help with the immediate emergency response as well as the longer term outcomes. "Scotland must not be kept in the dark any longer and I call on the UK government to urgently begin informing the Scottish Government of the movement of these convoys.